A new meditation room has opened at the Paynesville Area Health Care System, fulfilling a long-held dream for a private space for spiritual reflection. The room - located on the south end of the hospital, on the way to 700 Stearns Place and near the Koronis Manor - is the first project for the PAHCS Foundation, founded in 2002, which raised $80,000 for the room. "We've been looking forward to this for a long time," said PAHCS CEO Steve Moburg, "and we're so appreciative of the support." The 15' by 22' room is lined with maple with a high vaulted ceiling. Large glass windows face towards an inner courtyard, while stained glass windows, designed and made by PAHCS lab employee Kathy Ruhland, face the hall. The new meditation room at the Paynesville area Health Care System is the first project for the PAHCS Foundation, which started raising funds four years ago for the room. In all, $80,000 was raised to bring the project to fruition. Funds are still being collected for a fountain and a canopy over the patio in the courtyard for the project. 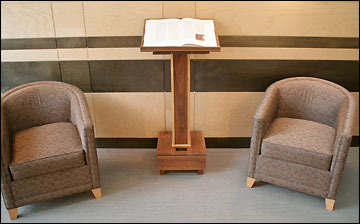 The meditation room features seating for eight, a nondenominational altar, and a lectern built by retired physician Ray Lindeman. On the lectern is a copy of Gospel and Acts from the St. John's Bible, also donated by Lindeman and his wife MaryLou, who also worked for PAHCS. 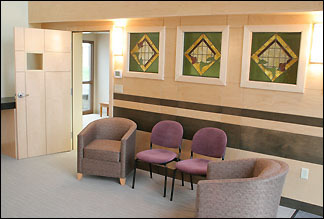 The meditation room, though, is intended as a private space for reflection for all people of faith: families during traumatic times; residents; and staff. In fact, to make the room non-denominational and accessible to all, it is being called the meditation room and not the chapel, which would be a more Christian name. Spirituality has always been "an integral part of the healing process," added Moburg. After years of seeing families huddled in hallways, trying to find a private space during a trauma, Dr. Allen Solum called the meditation room "long overdue." He explained, "Obviously, there are critical times for a patient and their family during hospitalization." The meditation room, added Solum, can be used by the whole campus: patients, residents, families, and staff. It's full benefits aren't known yet, he continued. "When hearing the meditation room was going to become reality, I was excited for a couple reasons," said a PAHCS nurse who frequently uses the room. "For myself, what better place to start or end a hectic day than in a room like that. Just a time to collect thoughts or plans for the day and review the happenings in my own life." "Also, there was money that was donated by families of some of our patients with cancer," she continued. "At the time it was donated, we had no real need for it, so it was put into an account for safe keeping. For families to know that the donations they made in honor of their loved ones went to the meditation room has to be very heart warming for them. Perhaps their donation can help to bring some peace or comfort to other families going through traumatic times. It is such a positive addition to PAHCS." This lectern and copy of Gopsel and Acts from the St. John's Bible were built and donated by Dr. Ray and MaryLou Lindeman. No formal services will be held in the meditation room; these will continue to be held at the Koronis Manor and at 700 Stearns Place. The room is meant to be available for families, patients, and residents during traumatic times. Construction of the meditation room began in April, and it was ready to be shown during PAHCS's 50th anniversary open house in early September. Addressing spiritual needs has always been a part of medicine, according to Lindeman, who practiced medicine in Paynesville for 45 years and is now on the foundation board. How that need has been met has varied, he added, leading to the new dedicated space. The PAHCS Foundation is still fundraising for additions to the room, said foundation director Jennifer Shinn, such as a canopy to cover the patio in the courtyard, a fountain, and a stained glass wall hanging being designed by Paynesville native Dale Louis. "We're very, very fortunate to have this," said Shinn. "It exceeded my expectations by far." A blessing ceremony for the new meditation room is being planned for this fall, added Shinn.